Each case is outlined below. If all Jedox services are running on the same machine (i.e., they can communicate securely via localhost/127.0.0.1), then encryption is optional. To indicate this, add the line encryption optional to the palo.ini. Note that all clients and functions will still require a HTTPS connection. If Integrator (Tomcat service) is running on a separate machine from the In-Memory DB, then encryption is required. The Integrator service communicates over the internal interface and is normally not reachable from the outside of the server. If you do not plan to communicate over localhost/127.0.0.1, then you must add the line encryption required to the palo.ini. Each “http” command must use https instead of http and the HTTPS port. This will create a file called “server.pem”. This is used for the first 2 parameters. will generate a file called dh2048.pem, this is meant for the last parameter. Copy the keystore from <install_path>\Jedox Suite\tomcat\conf\ and your certificate file to your java\bin installation to do so. Please keep in mind that you’ll need to remove the private key from your certificate file to get this running. 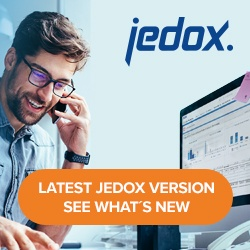 To encrypt the communication between the OLAP Server, Integrator, and Scheduler, it is necessary to add the certificate to the Jedox keystore. Java provides a tool called keytool that can be used to do so. The path to the Jedox keystore is <install_path>\Jedox Suite\tomcat\conf\keystore and the default password is changeit. By default, all files mentioned above refer to the same keystore file, except for <Install_path>/tomcat/client/config/etlcli.properties, which has its own keystore, stored in <Install_path>/tomcat/client/config/. This will only affect the etlclient.bat.